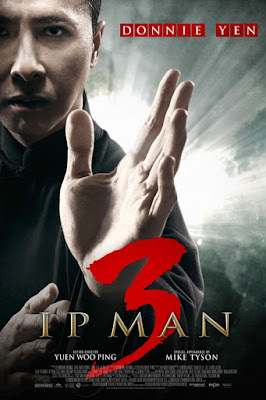 Ip Man 3 brings us a dream match up of Donnie Yen and Mike Tyson showing us that some realism can be thrown out the door for some Hollywood dollars. Besides Mike Tyson as a mobster and Ip Man conspicuously missing a son in the movie, the fight scenes as expected are amazingly choreographed without the extravagance visuals of The Grandmaster. 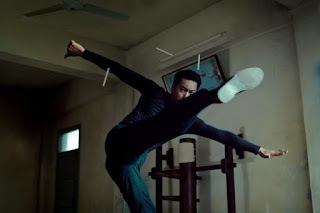 Donnie Yen has never been known for his acting skills and his movies have always been carried by his action scenes and this movie is no different. Ip Man 3, aside from the added element of Mike Tyson which is a big element, brings nothing new to the table from the other two Ip Man films. The introduction and use of Bruce Lee as an adult is interesting but a wasted effort in the overall story. The fight with Mike Tyson's character, which of course was inevitable was stylistically interesting but weird and too short. The best fight scene? The close combat against Muay Thai fighter Sarut Khanwilai in an elevator. Overall, the film will be enjoyable for martial art fans and Donnie Yen fans, but passable for everyone else. Zhang Jin as Cheung Tin-chi, who is also a Wing Chun practitioner challenging Ip Man puts on the best performance of the film and is worth keeping an eye on in future films for both his acting and martial art skills. Given the sub par performances and lazy plot, hopefully this is the end of Ip Man as far as director Wilson Yip and actor Donnie Yen's go at it.